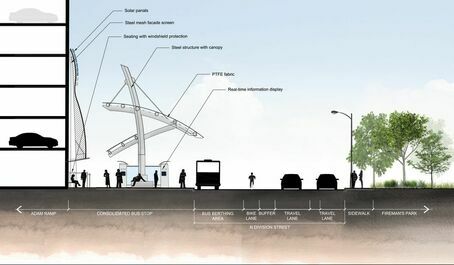 ​As part of a larger NYSDOT reconstruction project that is reconfiguring North and South Division Streets in Downtown Buffalo, the existing NFTA Metro Bus stop and pull-off near the entrance to the Metropolitan Transportation Center (the northeast corner of the intersection of North Division Street and Ellicott Street) will be relocated to a new bus stop and pull-off area located along the north side of North Division Street between Ellicott Street and Washington Street. 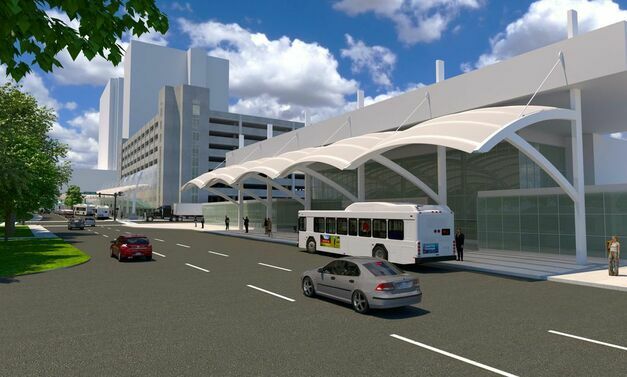 We designed a world class transit hub facility which includes state-of-the-art technology, rich pedestrian and bicycle amenities, weather-protected canopy, thoughtful landscape design, and integrates seamlessly into the urban fabric of Downtown Buffalo. The new Downtown Buffalo Transit Hub creates a seamless passenger experience between rail and bus that ties to the neighborhood and becomes a civic focal point. 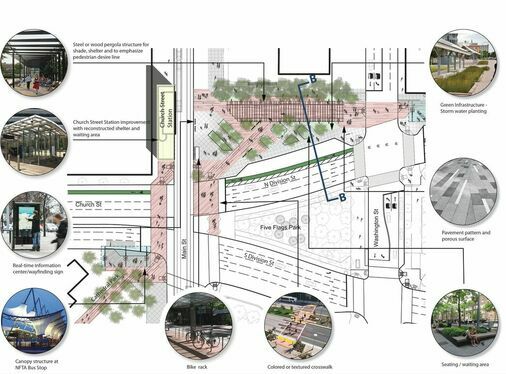 The key design features of the Transit Hub concept include plaza geometry, multimodal infrastructure, customer service technology, canopy, durable materials, and green infrastructure. 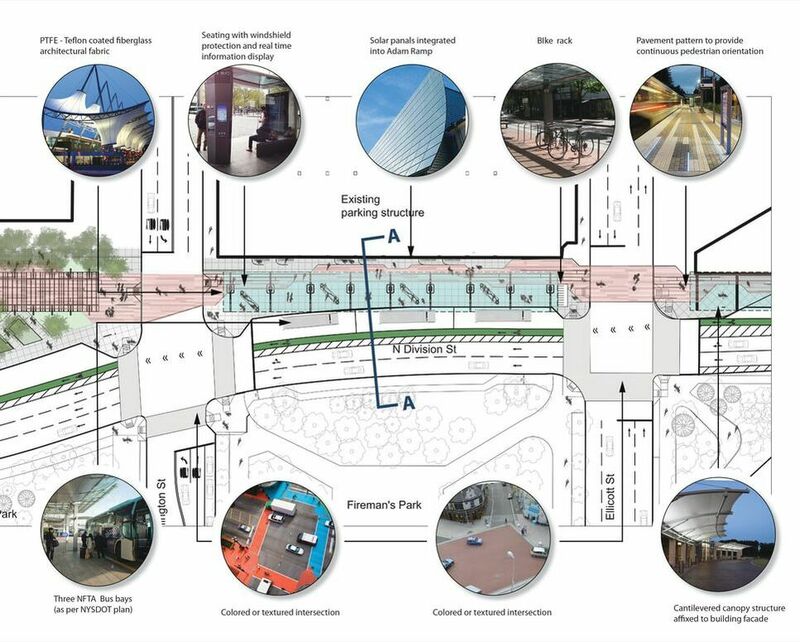 The diagrams illustrate over arching guiding principles that should steer the design of the Downtown Buffalo Transit Hub. 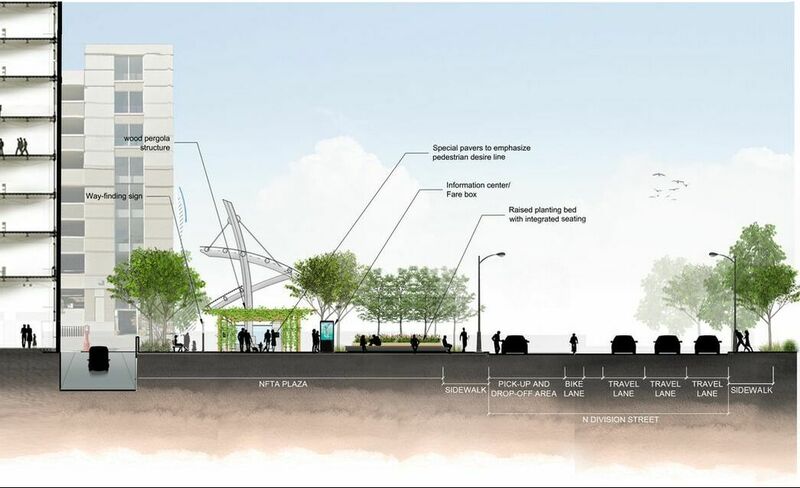 While the overall Transit Hub concept looks to provide improved connectivity across the three blocks between the Metropolitan Transportation Center and Church Street Metro Rail Station, the focal point of the concept is the iconic Transit Hub canopy itself, spanning one-block and providing a strong vertical element to improve the Transit Hub’s visibility as well as bringing enhanced customer experience with weather-protected waiting areas and state-of- art technology.